[two_third] Bill Sumner is currently the central organizing figure in the Orange County running scene as he has been for the past 40+ years. Traveling anywhere with Bill he is met with “Hey Coach” by the literally 10’s of thousands of people who have crossed his path. This isn’t just in Orange County but in virtually every city and airport he travels though. It’s unbelievable until you witness it. The key to his success is his uncanny ability to help people visualize their goals and establish a plan to achieve them. It also includes anticipating obstacles and being ready when they arise. His focus is not limited to athletic goals but primarily to personal life goals. Everyone has a story about Coach and how their lives are better because of their interactions with him. 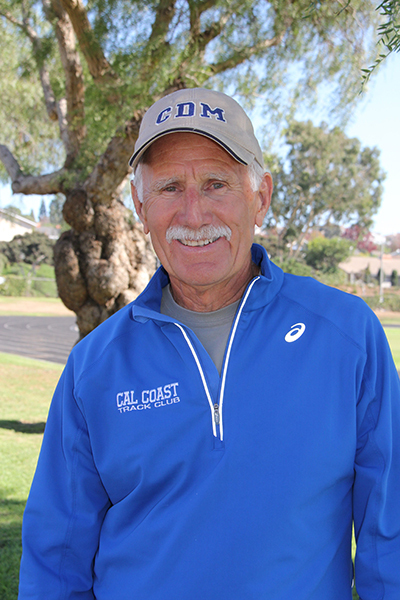 Bill is the head coach for Corona Del Mar High School Boys & Girls Cross Country and Track & Filed Teams and has been for the past 34 years. The dedication and coaching talent he brings to the school’s running teams are nothing short of inspiring. The school has the largest running program in the state of California with the most wins. Bill has led the team to 14 California Interscholastic Federations (CIF) championships, 8 state titles, and 2 national titles. Bill is the head coach for Corona Del Mar High School Boys & Girls Cross Country and Track & Filed Teams and has been for the past 34 years. The dedication and coaching talent he brings to the school’s running teams are nothing short of inspiring. In addition, Sumner has coached 27 Olympic Trial qualifiers and has coached at the U.S. Olympic Training Camp four times. He has also received honors as “California State Coach of the Year”, “Orange County Coach of the Year”, and was a finalist for the National High School Athletic Coaches Association “Coach of the Year” award in 2008. Runner’s World magazine has also profiled Coach Sumner. [/two_third][one_third_last]Coach Sumner also heads Cal Coast Track Club, a club he and four friends founded in 1982 and was originally called Active Five. The club continues to flourish with over 600 members. It trains together three times a week including the “infamous” Tuesday Night workout. The club runs together in many local, regional, and national races including most USATF Championship races. It counts a significant number of National Master’s Champions as members as well hosts an Elite Athlete development program. Bill’s dedication also extends to the Magic Shoe Foundation, which collects, cleans, and distributes new and gently used shoes to less privileged children and adults. Bill’s dedication also extends to the Magic Shoe Foundation, which collects, cleans, and distributes new and gently used shoes to less privileged children and adults. It’s a full-time job done part-time and carried out with a small group of volunteers. “When something is worth doing it gets done, and our Magic Shoe work is worth doing” he says. The Foundation has distributed over 100,000 pairs of shoes. Bill originally started the program for kids that didn’t have running shoes so they could run and has grown exponentially to include weekly Wednesday & Friday deliveries to schools, soup kitchens, homeless shelters, churches, Boys & Girls Clubs, assisted living facilities, and others.